That’s an ambulance hustling north on I-5 toward the Brownsville exit Monday afternoon. 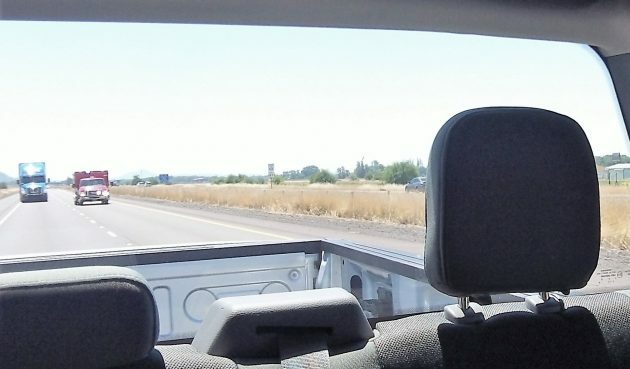 I wasn’t sure what to do when, driving up I-5 from Southern Oregon Monday, I heard a siren and saw an ambulance coming up from behind. I didn’t think the standard instruction in the Drivers’ Manual — pull to the right and stop — made any sense in this case. Nobody else on the freeway that afternoon thought so either. Certainly the driver of the 18-wheeler in the snapshot above didn’t, because I didn’t sense him slowing down. And since the left lane was open, why should he? Why should anyone as long as the emergency vehicle, the ambulance in this case, could go as fast at it dared and there was nothing in its way? Yours not to reason why, Hasso. If we leave this up to the discretion of individual drivers, we will certainly end up blocking traffic at some point. The utter disregard for emergency vehicles that I’ve seen leads me to believe that if only for the discipline of doing so, we should stop for the red lights and sirens unconditionally. There’s too much analysis of whether laws “should” apply and individuals deciding that all law is circumstantial. It’s not. Amen to Mr. White’s comment. Drivers in general pay no attention to what is written in the drivers’ manual. It wouldn’t do any harm if everyone would reread the manual at least every two or three years. I happened to be waiting at DMV and gave a quick look at the manual to pass the time. I learned that there are things now legal that weren’t in the “old” days. Too bad you can’t understand this. It’s clear to me – it’s safer for all involved.